Super Hero Boy: Your baby smarter than ever. Your baby smarter than ever. When I first found out I was pregnant with Connor I was working part time in the ER at a hospital and I remember being in the room with one of my regular patients and she said to me "Ahh!! You have to get your baby a Baby Einstein DVD!!" At the time I was pretty much clueless about baby products and I have to admit I thought to myself what on earth would a baby do with a DVD. Well needless to say I listened to her regardless and got Connor a Baby Einstein music CD and a Baby Einstein Baby Mozart DVD which both ended up being a lifesaver when Connor had problems napping as I would put one of them on right before nap time or play the cd in the car when he was fussy and no matter what was going on he would stop crying and stare at the screen. Actually when he was only a few months old he would try to raise his head out of the bouncy seat to see the spinning ball toy every single time it came on. Sadly we loaned the dvd to a friend and she moved away without telling us taking the dvd player and dvd with her. Go figure. 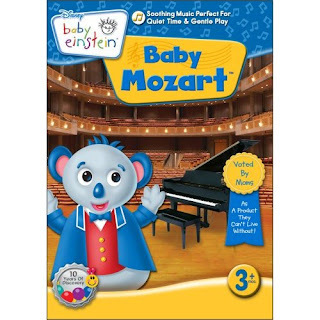 Baby Einstein has a new version of their wildly popular Baby Mozart dvd out now and I was a bit worried that Connor would now be too old for it as we are nearing the two year old mark. Well strangely enough he has just recently starting having some problems sleeping and he woke up tonight about an hour into bedtime. Our mp3 player has been on the fritz lately so I decided now would be the perfect time to try out his new Baby Mozart dvd. I turned on his tv and started the show and at the very first scene he sat down in bed and smiled. Needless to say he has been asleep for several hours and I haven't heard a peep out of him. If your not familiar with Baby Einstein's dvds the music based dvds Baby Mozart, Baby Bach, ect do not have much or any talking in them. The dvd is set to classical music and the dvd shows toys set to the music. The effect is soothing and really int resting for babies to watch. It was one of the few ways to keep Connor's attention for more than just a few seconds when he was little and I would point at the toys or items on the screen and name them. For that reason alone you can use the dvds as part of your soothing routine before bedtime or as a learning tool. The music cds are some of the most fabulous collections of classical music I have heard designed just for babies. I would not leave the house without Connor's when he was little as I could not stand to hear him cry in that infant car seat while I was driving as I was always tempted to pull over and check on him. When we had our Baby Einstein cds with us I would just pop one in the cd player and usually they would calm him down without fail and I could get where I was going without stopping ten times. What I didn't know was that Baby Einstein makes books too. We got our hands on the Touch and Feel Animal farm and its been a huge hit with Connor. Each page has a different farm animal with a spot in which you can touch them. The sheep has a woolly tummy to touch, the cow a leathery nose and the horse a super soft furry neck. Touching the animals is not just fun but its a way to get them to focus on the animal as you say the name for the animal. It's also a great introduction to manners as the book asks each animal "May we touch you today?". You can see and learn more about the Baby Einstein DVDs, CDs and Books over at the Baby Einstein website. Thanks Mom Central for letting us know! I think I'd go with the hungry pelican bath toy, although those pillows are darling and we really need one! Tough choice! They have some fun looking things!! !